Payhembury Tennis Club is one of the few sporting organisations in the village and has a single tarmac court situated in the playing fields. It has a history going back 30 years when the court used to be grass. 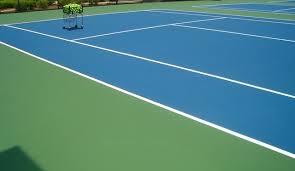 In modern times the tennis club has recently been successful in a bid to improve the facilities and surface. People wanting to play on the court should use the booking sheets that are held at Payhembury Provisions and there is a small charge for non-members. Membership forms can also be found below, printed, filled in and returned with the relevant payment in cheque form if possible made out to Payhembury Tennis Club to 9 Hillside Payhembury EX14 3HB. Annual fees are due in April £30.00 for a family £20.00 for a couple £15.00 for a single £10.00 for a junior, OAP or student. We feel these prices are very good value as they give members free access to the court all year. And becoming a member enables the court to remain well maintained. Contact 01404 841843 for details on the club. We are only a small committee and anyone who would like to get involved please get in touch. To download and print the Membership Form please click PTC Membership forms.